It was only a matter of days before critics of the document emerged, complaining that it doesn’t specifically attack the oil and gas corporations and that Bolivia itself has oil and gas. Some go further to criticise the Bolivian government for BEING a government, on the basis that all government is bad! The government of Evo Morales did not come about by accident, but through a range of powerful social movements – against water privatisation, against the ban on coca production and against the oil and gas corporations. These had to find a political expression and the form that took was Morales' MAS party. But for the critics, this is not enough. Bolivian oil must stay in the ground, whilst Exxon and BP carry on dirty business as usual. The renationalisation of Bolivian oil and gas is not enough. 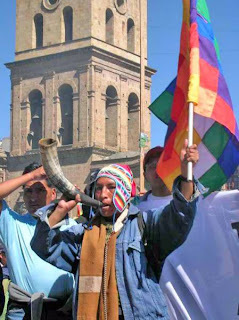 Rather the Bolivian state must abolish itself and hand over power to social movements for “bottom up government”. The introduction of a Constituent Assembly is all well and good – but it is the wrong kind of constituent assembly because it allows political parties, critics claim. A pluri-national state is not going far enough, even though this significant decentralisation has been carried through in the teeth of opposition from the right wing. South American leaders always have in mind the 1973 bloody CIA-backed coup in Chile, which killed leftist president Salvador Allende and thousands of his supporters, driving hundreds of thousands into exile. The harsh lesson of Chile (it was the same lesson Marx and Engels learned from the Paris Commune) is that a socialist government cannot rely on the structures of the capitalist state. It has developed with the purpose of enforcing the rights of private property and can’t be made to support an entirely different set of economic and social relations. It must be dismantled and remade. But in so far as the Morales government is at least taking bold measures to alter the state in Bolivia, with significant decentralisation of power and an independent line in respect of the corporations, it should be supported. A social movement is not a government – it cannot deliver rights, laws and a constitution. It certainly cannot defend Bolivia from civil war or a bloody coup that the CIA and others are no doubt discussing. People in general want to live in a law-governed society – just not one where the laws are there not to protect them but to protect private property and the corporations alone. This is the big challenge facing all socialists and communists. How do we make the transition from capitalism to socialism, when developments and struggles take place in myriad ways and locations? How do we move from a capitalist state to a transitional, democratic state? Of course it would be wrong to idealise the Bolivian government. But there is something truly reactionary and petty about these criticisms, coming as they do from people who have given up on the idea of revolutionary politics and submerged themselves into protest and social movements. In practice, the only way to truly support the Movement Towards Socialism, as Morales’ party is called, is by bringing about revolutionary political change in countries like Britain and the United States. That is our responsibility and that is why A World to Win has produced a Manifesto of Revolutionary Solutions, to suggest the basis of a way forward. First, I think this is a fantastic blog. I have been curious about MAS and its good work in Bolivia for a long time. Thank you so much. With regard to your recent post, again, pretty cogent. One cavil, though, might be with the statement: "In practice, the only way to truly support the Movement Towards Socialism, as Morales’ party is called, is by bringing about revolutionary political change in countries like Britain and the United States." Unfortuantely, a socialist revolution is simply not an immediate option in the advanced developed countries. The situation is objectively not revolutionary. We have large (and fairly conservative) middle classes with significant, though exaggerated, upward mobility. The best the left - reformist or radical - can possibly do in the Anglo powers is to resist imperialist tendencies in the government and the population at large. Objectively revolutionary situations only exist in developing countries like those of Latin America. The next wave of social revolutions will almost certainly begin in the 3rd world, and might be bottled up there for a long time. The problem, of course, is that the underdeveloped condition of these countries will necessarily distort and hamper any socialist project, as it did in Russia and China and many other places in the 20th century. My tedency is to believe that the Left must simply change some of its paradigms, adapting ends as well as means as the situation warrants. Above all, I believe that radicals in the 3rd world must self-consciously bend all efforts to avoiding the problems and gross excesses of Russian communism, and to create as much political and personal freedom as circumstances permit.